The sale of exclusive media rights for professional sports entertainment is a global phenomenon. Sports being played at the highest levels around the world are drawing enormous crowds and so too are they drawing the interests of media networks. The result has been bigger rights deals in every league and the ripple effects are especially seen in the NHL. To better understand how media rights deals are affecting the NHL, let’s first take a look at how they’re driving revenues for the world’s biggest sports. Deloitte Global, the world’s largest audit, tax and consulting firm, has predicted that the European football (soccer) market will generate $30 billion in revenues for the 2016-17 season. That’s almost as much as North America’s big four sports combined. Collectively, the NFL, MLB, NBA and NHL are expected to generate $36.5 billion for the 2016-17 season. 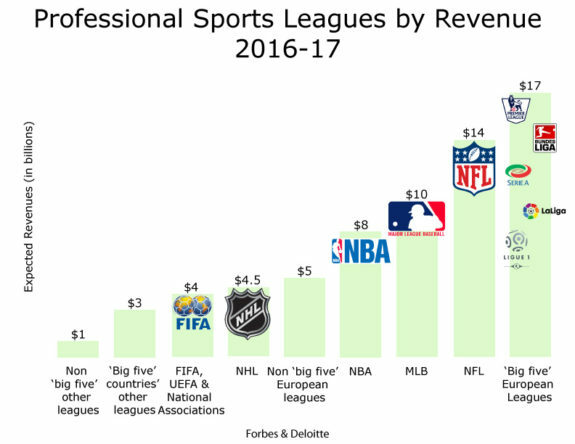 Professional Sports Leagues by Revenue for the 2016-17 season. According to the consulting firm, European soccer’s domestic live broadcast rights for the English Premier League (EPL) in the 2016-17 season increased by 71% from the prior agreement. Soccer is a global sport and its growing audience is fuelling these record-size deals. Although the NHL has a long way to go before it garners fan bases even remotely close to the size of American football, European soccer, baseball or basketball, it may be paving the path to unprecedented rights deals down the road. The NHL is ‘tailor-fitting’ their product to market demands and increasing its entertainment value by doing so. The salary cap era is where this ‘tailoring’ job began. The NHL’s revenue sharing structure differs from that of other professional sports. For example, in Europe, soccer is the biggest sport in terms of fan base and revenues. However, championship teams receive a bigger percentage of the revenues generated from the next season. This means that clubs like Real Madrid FC, who keep on winning, keep getting richer. That, coupled with no salary cap, allows club owners to lure the world’s most elite players with promises of great wealth and glory. This revenue distribution structure is also why it’s possible for average players on championship teams to make more money than stars on mediocre teams. Over time, the gap between great clubs and good clubs has widened, thereby lowering their level of entertainment. For fans in England, there are questions regarding the increasing costs of watching soccer, especially when it comes to ticket prices and TV subscriptions, all the while performance and competition levels are dwindling. In fact, the Premier League recently embarked on a new deal that puts a cap on how much soccer clubs can charge to visiting fans. A representative survey conducted by a couple of sports economist professors from the University of Tübingen in Germany revealed that ‘competitive balance’ in soccer plays a significant role in the USA. Their research confirms that leagues who offer close championship races are perceived as being exciting and attract more spectators compared to competitions dominated by just a few clubs. It would make sense that this applies to all sports — games are simply more entertaining when competitors are more equally matched. So, in European soccer, championship clubs are rewarded with more money and in the NHL losing teams are rewarded with more first-round draft picks. This is great for NHL teams through the three years following the draft pick’s entry-level contract signing. However, for teams who’ve endured chronic losses over a number of years, their accumulation of first-round picks becomes unaffordable under the salary cap. This is the current situation of the Edmonton Oilers, and the same is expected for the Toronto Maple Leafs in two seasons. The solution is one of two courses of action. The first option is for teams to trade an asset, as we saw with Taylor Hall in Edmonton. 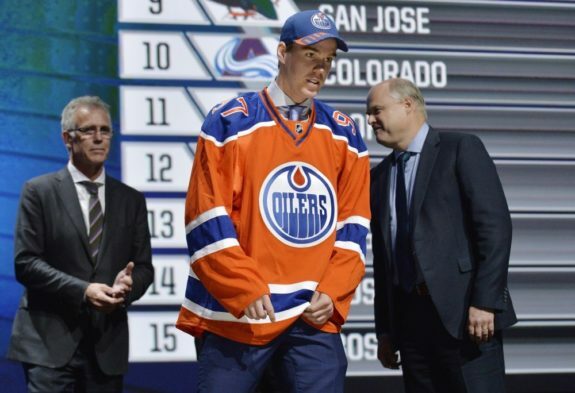 The second option is that players will accept smaller contracts to stay, as the Oilers claim was the case with Connor McDavid. 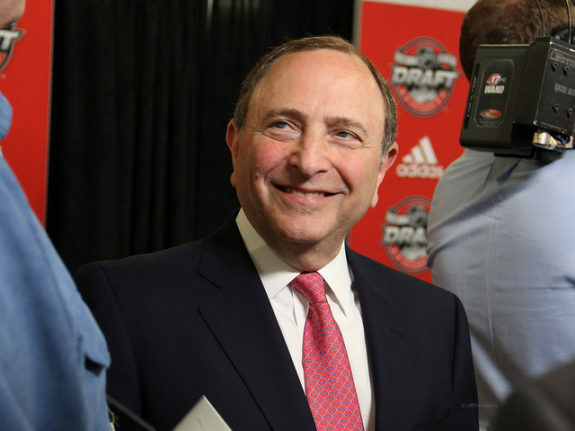 By utilizing a salary cap system and having a revenue-sharing arrangement, NHL Commissioner Gary Bettman is creating a system of parity and fairness that produces exciting competition among all NHL teams, not just a select, rich few. In Europe, the same cannot be said about soccer. There, the Premiership is tapping into new global markets and we can see this with the increasing domestic broadcast rights fees and thus, revenues continue to increase. Large television audiences allow leagues to sell exclusive broadcast rights to networks and with each new deal come’s a record price tag because audiences are getting that much bigger. European soccer is growing its fan base in North America, Asia, and Africa at a phenomenal rate. However, these football leagues haven’t understood the value of parity in sports from a business stand point. Their fans are growing tired of overpaying for a product with a diminishing entertainment value attached to it. Furthermore, soccer players are getting increasingly frustrated when mediocre players and newbies are making more money than their more talented and seasoned counterparts. In terms of growing the game globally, the NHL is in its infancy, but while they work towards increasing scale, they continue to deliver a high-value product and maintain its integrity by using a salary cap to ensure its teams are well-matched and paid fairly. Down the road, the NHL won’t be questioned for selling a product unfit for its price tag. On the contrary, this league is priming fans for what may end up being the world’s most entertaining sport due to its parity, competitive balance and evenly matched competition.